All-in-one coffee and filter things are a quick way to make just one cup. But these coffee pods—coffee’s convenience craze of the century, otherwise known as “K-Cups”—are also a quick way to wreak havoc on the environment and, quite possibly, our health. My son, who turns 13 in a couple days, had been begging for one of these machines for Christmas. Yes, he drinks coffee. Only on the weekends. Guess what my son got for Christmas? You guessed it. A Keurig single-cup coffee brewer from the dark side. And I had nothing to do with it. I think my son was even more surprised by this gift than I! Thinking he’d escape the wrath of Lynn, my husband searched and searched online for the coffee pods with the least environmental impact (during which time he could have brewed a year’s worth of coffee the old-fashioned way). I have to give him some credit for the effort—he tracked down an organic coffee that makes compostable coffee pods. Of course, if they did take the time to dispose of the coffee pods properly, that would cancel out the convenience factor. It’s too late for me and my family, but I dug up some un-green facts about coffee pods and K-Cups for the rest of you. I hope you’ll share this to help sway others to brew coffee the old-fashioned way and give the earth a break. 1. 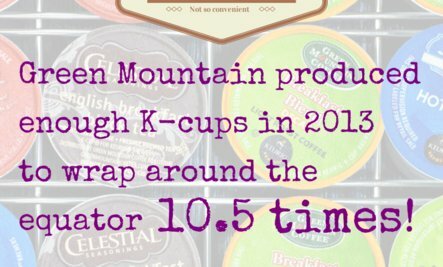 In 2013, Green Mountain produced 8.3 billion K-Cups, enough to wrap around the equator 10.5 times. (Source: Mother Jones) This year, Green Mountain signed a 10-year agreement with Coca-Cola (with Coca-Cola owning 10 percent of Green Mountain) to create some type of single cup cold beverage whatever. No doubt, those K-Cup numbers will increase exponentially as a result—maybe they’ll pile up high enough to reach the moon. It’s worth noting that Coca-Cola was a nominee for Corporate Accountability International’s 2013 Hall of Shame for obstructing national park efforts to go bottled-water- free. Nice work, Coke. 2. Only five percent of its current cups are made out of recyclable plastic. The rest is number 7 plastic, non recyclable in most places. On a side note: What about the leaching from the plastic? There’s hot water going through all those plastic brewing system (true for many traditional coffee-makers). BPA-Free is turning out to be just as bad (sometimes worse) than BPA. 3. Once the machines break down, it‘s mostly plastic. Hello landfills. Plastic never biodegrades—it photodegrades. That means it ends up breaking down into tiny particles of plastic that end up in our waterways and, eventually, the food chain. Might as well sprinkle this on your coffee! 4. If you‘re a Green Dude or Diva and your significant other is not, the coffee pods my create tension in your relationship. Every time I see that machine, I cringe. The la-dee-da organic, somewhat recyclable coffee pods my husband purchased do not make up for the fact that these coffee pods are the epitome of the un-green. There’s a bit of resentment that stirs in my gut every time I hear that contraption warming up. 5. Using K-cups could cause weight gain over time. Think of the calories you could be expending to open a bag of coffee beans and grind them up (to save time, use one of those new-fangled coffee grinders). Put the ground beans and some boiling water into a coffee press (these are made of glass—guaranteed not to leach plastic toxins, which may lead to obesity). Soon, you have some tasty coffee. During that short wait time, you can take a bathroom break or tie your shoes. If you want to save a little time, tie your shoes while taking the bathroom break (men, tying your shoes is not recommended while standing). 1. Purchase a reusable filter. Buy the gold cup version, otherwise it will have plastic parts which may leach toxins into your coffee making it more of a witch’s brew. 2. Don‘t buy any more K-cups until 2020. Keurig Green Mountain has a sustainability target to make all k-cups 100 percent recyclable by then. 4. Find a sustainable-ish coffee pod brand. We use San Francisco Bay Organic. 5. In the middle of the night, stage a fake break-in. Disappear the Keurig and a few other valuables, which you can secretly donate. Coffee pods photo shown in graphic via shutterstock. Written by Lynn Hasselberger, Green Diva and Founder of myEARTH360.com. I make my own one cup drip...MUCH CHEAPER>>>>means I can use ORGANIC coffee! I too got rid of the K cups for our Keurig and now we only use the refillable pods . It is a little more work to get the satisfaction of a freshly brewed coffee but so worth it . Almost all coffee makers are plastic so we'll keep our Keurig .